I’m no stranger to petrol-electric hybrids, having run a Lexus NX as a long-termer a couple of years ago. That means I’m used to the pleasurably quiet sensations of running under electric power alone, especially when making a slow start away from a standstill. 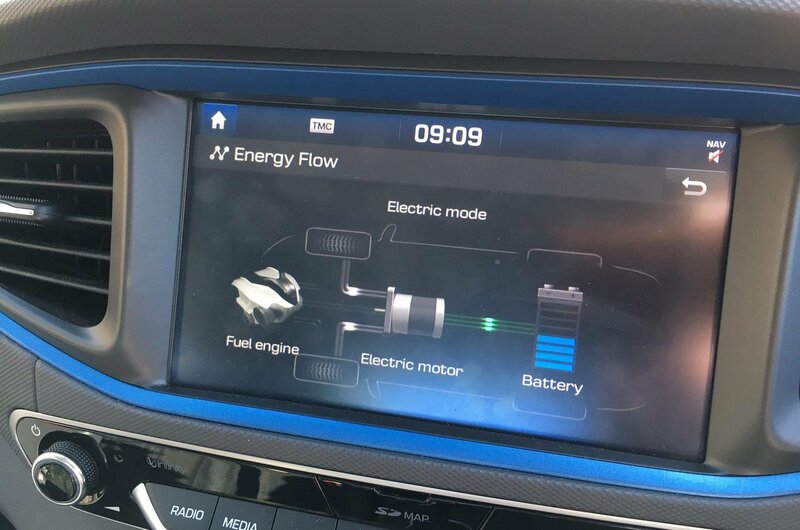 Alas the Ioniq is as frustrating as the Lexus was: if you press too enthusiastically on the accelerator pedal, or drive it any distance over about half a mile, or if there’s not enough juice in the battery, the petrol engine cuts in. An all-electric Ioniq is available, of course, and for an even better electric range than our car there’s a plug-in hybrid version, too, which can up the electric-only range to as much as 31 miles. Unlike the Lexus, which has an electronic CVT gearbox with no stepped gears, this has a more conventional six-speed dual-clutch affair, and although it’s not as smooth it feels much sprightlier as a result, and doesn’t make a noise like a rutting stag. In fact it’s a surprisingly lively thing, this Ioniq. Stick the gearbox in its Sport mode and it responds to the accelerator pedal like a whippet to a starting pistol! It might be no quicker on paper in this mode but it certainly feels it, with the illusion enhanced by the electronic instruments turning a vivid orange and a rev counter magically appearing on the panel in front of you. The steering firms up in your hands, too. 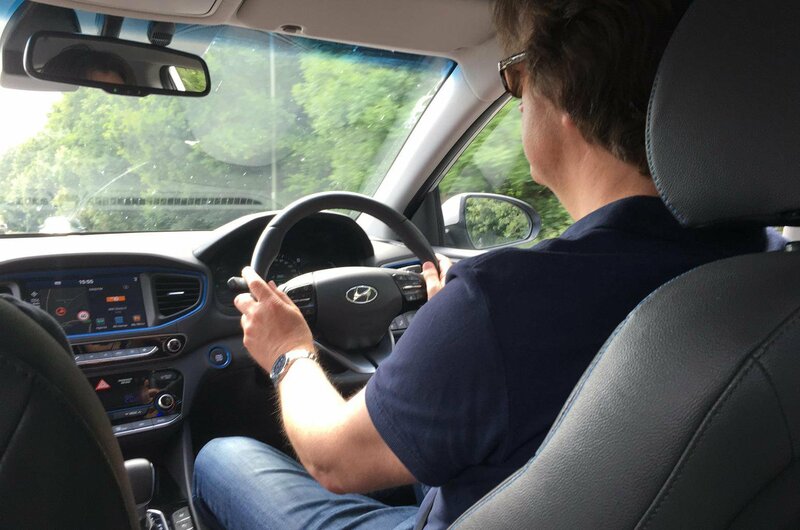 In truth, there is probably a little too much heft to the steering in this mode, and as the standard weight feels pleasant enough it’s perhaps not really worth bothering with Sport for long, especially as it’s not likely to do much for your fuel consumption figures. I had thought that consumption pleasingly abstemious, until I checked my facts. Regular owner Will Williams has been achieving figures around the 48mpg mark, both on the digital readout and as measured by filling up the tank, and I’ve been seeing that too. I must admit I thought this was pretty good for a car of this size and weight. For example, my regular 1.0-litre petrol-engined Honda Civic long-termer has only been seeing around 38mpg, and the admittedly heftier hybrid Lexus SUV I mentioned earlier struggled to better 32mpg. So I thought the Ioniq was doing well until I checked its official combined fuel figure and found it to be 78.4mpg. Following on from that 48mpg can only be viewed as a bit of a disappointment. 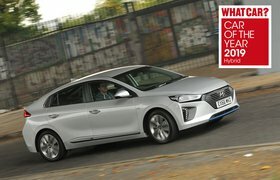 However, the Ioniq is still impressing in one other area. Modern cars, even ones not necessarily sporty by nature, often have large eye-catching alloy wheels and low tyre sidewalls. 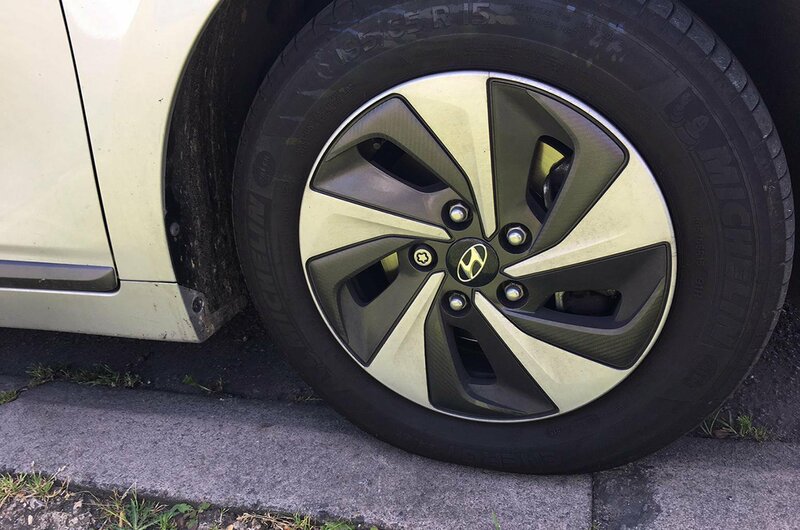 Scraping one of these wheels against a kerb while parking is too easy to do, and I often end up nervously leaving these cars about five feet out from the pavement. However, both of the Ioniq’s door mirrors dip when you start reversing to show you the car’s distance from the offending kerb, which is a nice touch. Alas the only disappointment is that the Ioniq doesn’t have sticky out alloy wheels or low profile tyres - quite the opposite in fact - so it’s actually unlikely to sustain much wheel damage via kerb contact anyway.